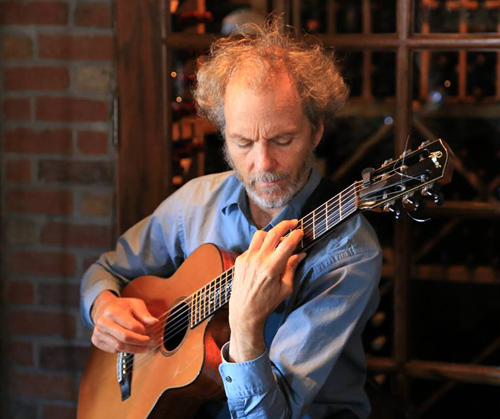 Peter Sprague | Gettin’ Older But Grooving Nonetheless! Gettin’ Older But Grooving Nonetheless! Hola Good Folks, bossa nova and Rosa Passos fill the airspace over here at control central, the sun is trying to poke out, I’m putting some words together for you, and all and all, it’s a good Cali moment in time. Later today Kylie and I are heading for Torrey Pines to take in a hike and a swim and then we’re off to Uncle Tripp’s for his birthday celebration. Gettin’ older but grooving nonetheless. 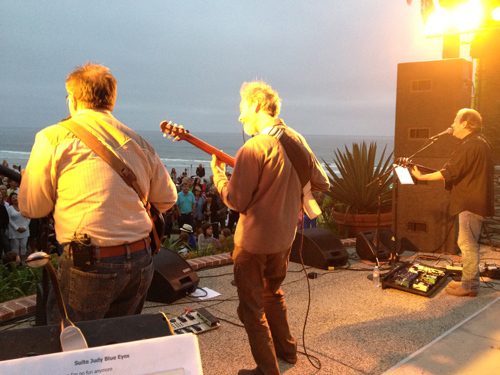 Last week we had an incredible ride through the sonic unfolding of “Suite Judy Blue Eyes” at the park in Del Mar. The band was on fire and for me, having the opportunity to solo over the great acoustic guitars of Jim Soldi and Mark Twang was a true joy. Folk rock bliss! Expanding out on Judy Blue Eyes with Jim Soldi on the left and Mark Twang on the right. Live at the Del Mar Powerhouse Park. 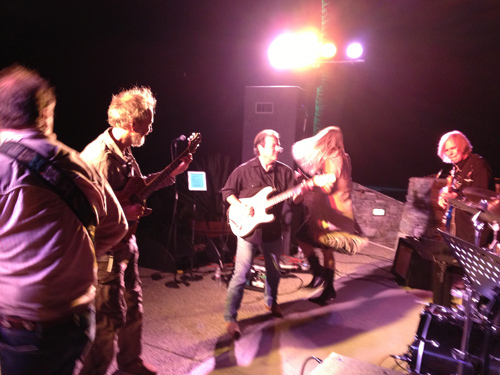 “Ohio” rock fest with Jim, Peter, Mark, Eve Selis, and Rick Nash. 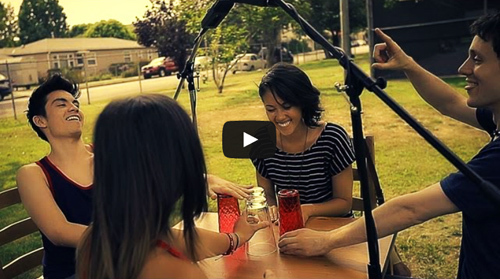 I came across this cool vid of these four young singers sitting across from each other at a table and not only singing up a storm but supplying rhythm by way of clanking cups on the table. Brilliant and check it out! I’ve been in a mixing mode and I just finished a Russian Orthodox vocal record for a fellow named Vlad. Before that I’ve been immersed in the finishing touches on my jazz vocal recording project featuring Leonard, Kevyn, Lisa H., Matt, Katie, Fletcher, Sharmala, and Allison. I’m almost done and look for it a little further down the way. We had a great Roxy gig last week with some fun sit-ins including young Eliza Kiy on guitar. She was fantastic! I met her earlier in the summer at the UCSD Jazz Camp. We played a couple of standards and the highlight is when we went off the page and she just flowed with the freedom and what immerged was a Bach 2 part invention of sorts, less organized but still highly contrapuntal. So this week is the Roxy gig once again on Thursday and it’s always a great hang. A steady troupe of good folks make it out for the music and the second set morphs into a looser jam. Hope to see you there! Peter and the revolving option of silence. Coming up later in the week on Friday night, I’ll team up with Gilbert Castellanos at the Westgate Hotel downtown. He’s one of my all time favorites and the last time I did this gig it was a true hit. Can’t wait! And for the rest of the week I’m driving between here, Fallbrook, Coronado and Del Mar for a collection of private gigs. See you on the freeway! 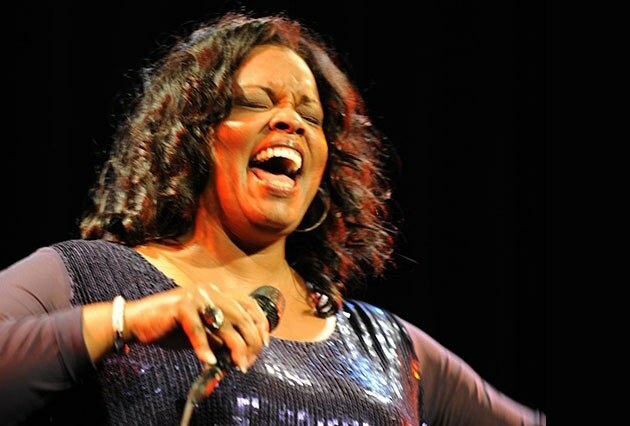 I’m zipping off to play with Dianne Reeves next week in Michigan. We’re gigging at the Grand Hotel on Mackinac Island which has a ton of history included. It’s a place that cars aren’t allowed and still lives in the past century. The commute there is a car to a plane to a 2nd plane to a limo to a ferry to a horse drawn carriage to the venue kind of a deal. Giddeup and see you there! The one and only Dianne Reeves! I got to thinking about my Dad lately and this led me to revisit the recording we made back in 2004 called Hurry Home. I’m so glad we pulled this project together. My Dad had been part of a few of Tripp and my CD’s with Blurring the Edges and the idea was to do a recording where he was the boss and got to choose the songs and direction and even compose for the project. 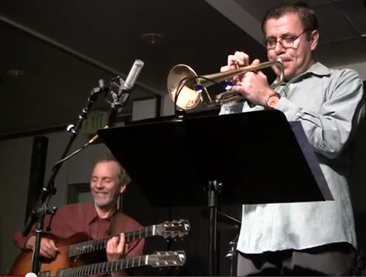 It was a hoot with Bob Magnusson on bass and my Dad Hall on drums, the amazing rhythm duo he would joking refer to them. We recorded for 2 days and Hall loved jazz standards and that was the heart of the project. My favorite was his own tune called “Hurry Home” and it was amazing to me, this dude had no formal musical training and came up with a cool melody out of thin air. He conveyed the melody to me via his funny whistling and from there I outfitted it with some chords and there it is, “Hurry Home” from the creative penmanship of Sir Hall Tripp Sprague senior! Check it out here!! The first comment dated August 26 hit a heart string…my late Dad’s birthday! He wasn’t educated or a musician, but he was one of the hardest working guys around and completely devoted to his family. He was 88 when he passed. In grade school he let me and my 5th-6th grade musical colleagues jam out (Stones, Beatles, Cream, Hendrix et al.) in our garage. When the neighbors called the cops because it was too loud, he would talk the cops into letting us play until curfew at 10. He had a cassette recorder in the bedroom over the garage and would record our rehearsals. We never had to worry about getting to gigs (VFW, Jr. High Dances, Parties etc.) because he had the station wagon ready and waiting. It blows my mind to think that as little kids we had an extensive set list and played pay gigs. When we played the city recreation committee dances they payed us with coupons for eats at the pizza shop. In addition to being my hero, superseding even Joe Pass, and role model (to the extent a creative artist can emulate his incomprehensible common sense) he supported my surfing with as much gusto as my music. He would drive me and my surfing buddies uptown where the waves were usually better or Ocean City. One time he dropped us off there and it was the middle of winter–freezing! The swell dropped and we froze our asses off on the beach waiting for the time he was to pick us up. We’re talking late ’60s, early ’70s–the cell phone was in the same realm as, ” Beam me up Scotty.” We wore divers wetsuits with a beaver tail that would scratch up yer deck. Multi-national surfing labels and products were unheard of: who’d of guessed surfing would become an international marketing device and shapers would cad/cam their dimensions into a computer so that a machine can be fed x number of blanks and spit out x number of identical sticks? In short–yea right–you were lucky to have such a hip father and to be able to record with him. If he’s still around, I wish him the best. If he passed, may he rest in peace! You and I are getting older and groovin’ no doubt, mostly because we had groovy fathers. We were blessed fer sure. By the way…nice website, bro! Great concert in Sedona. I’m suffering from a deficit of surf and jazz. Thanks for the temporary relief on the jazz front. This is my first attempt at living away from the coast. I never realized how much surfing effects your playing! When my lease is up…? Hey Jim, love your note and dig your stories of your connection with your Dad, surfing and music. Me too, great old man that loved jazz and supported my life into the great unknown career path of music. Risky but for sure the way to go! And yes, Sedona has been a fun hang. We jammed out after the concert with some of the locals and we’re heading back this morning. Good life!